After the re-release of their fifth studio album "Daybreaker", in which they included one of the best covers of indie folk music a metalcore band can achieve ("Blood Bank") and perhaps the catchiest mathcore song since "Milk Lizard" ("Black Blood") It's hard for a band like Architects to top such a phenomenal record. Forming in 2004, this band has quite literally traveled the world and a worldly view has crafted the encompassing and universal themes of their sixth album, "Lost Forever // Lost Together". But Architects evolution over the last six years has been one laced with change. 2009’s "Hollow Crown" was an excessively repetitive album: Through-out the entire record lays the same re-hashed Meshuggah guitars and Dillinger Escape Plan dynamics but in a better package than their last albums. But despite this, it built such a cult following in the British alternative scene before 2011’s "The Here And Now" marked a supposed “car crash”, despite having both good singles and a good sound, which essentially was a metallic Alexisonfire. 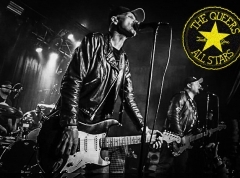 The band faced the generic and uncomfortably juvenile claims of selling out when it’s clear that a band like theirs can never just be “thrusted” onto the mainstream. "Daybreaker" was the dawn of a new Architects, one far more confident, dynamic and thoughtful, swirling with violent aggression of metalcore without lacing itself with the cancers of smaller acts like near constant bass drops and breakdowns and instead using political lyrics, progressive metal structures and orchestration. A band that have progressed beyond their influences and have grown to stretch the boundaries of their genre and what their contemporaries do. “I hope you choke on the vows that you failed to deliver. You said you'd change the world, but death still flies east. The blind lead the blind, so we bomb for peace.” screams Sam Carter on the passionate and candid message of “Grave Digger”. “I know it haunts you, it haunts me too. We're all on our own, we can't decide what's true. Why are we fighting, when I'm just like you?” bellows Carter again in Architects’ speech to humanitarian unity. It’s definitely an album with serious themes in mind, much like “Daybreaker” but with far more refined ideas. But what was the best element is that past their angry delivery, just how positive the message is at times. Guitarist and lyricist Tom Searle’s critical assessments of society, politics and religion flow with hope and are crafted like speeches; like a charismatic man at Speakers' Corner in London. “Lost Forever // Lost Together” is without a doubt a very intelligent and intricate record, part-technical, part-melodic, part-groove and fused with plaintive ambiance and paced symphony. There are many key examples of this. “Broken Cross”, a song about the decadence of spirituality caused by religious extremism, mashes euphoric melodies, powerful guitar grooves and haunting electronics which epitomizes the sound of this album well, while “Colony Collapse” is guided by a lonely violin as it fluctuates between sung balladry and angry blast beats; effectively making it both the lightest and the heaviest it can be. With each song the band offers more and more, such as the rabble-rousing pace of “The Devil Is Near”, the post-metal epic of interlude “Red Hypergiant” with its unforgettable riff or the end of the world sound of “Youth Is Wasted On The Young” with the brilliantly drab vocals of Murray Macleod "of The Xcerts. From first listen, "Lost Forever // Lost Together" is all the anger and spite that helped “Hollow Crown” establish the band mixed with all the delicacies and themes of “Daybreaker”. The fact is that Architects and their producers Fredrik Nordström and Henrik Udd have done tremendous work, so well in fact there just isn’t enough space to cover every element. They, alongside Bring Me The Horizon are crafting the sound of post-metalcore and in the future we’ll look back at theirs as turning points in heavy metal music. 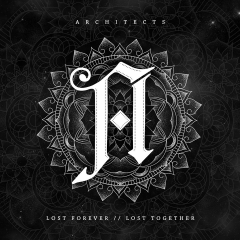 Architects have truly become very confident in themselves, and through that confidence have crafted not just their finest work, but one of the finest album’s you’ll hear this year.